Helen is host to a variety of activities, such as hiking and whitewater rafting, and is one of the most gorgeous wildernesses on the planet. If you're looking for some attractive places to enjoy some fresh air and relaxation, here are a few of the best of Georgia's Forest & State Parks in the area. What's more beautiful than the changing of the leaves in the northern Georgia mountains? Although Helen is known for its beautiful scenery throughout the entire year, autumn is a particularly special time. As the familiar greens of the trees begin to transform into brilliant shades of red, orange, and yellow, tourists flock to the area for the chance to take in the fabulous views. Of course, during your visit, you'll have the luxury of enjoying the leaves from the porch or expansive windows of your vacation cabin, but there are also plenty of hot spots in and around Helen where you can take in the sights and capture some truly incredible pictures. To help you plan your trip, we've complied this list of 4 of the best places do go to see the fall foliage during your trip to Helen this fall. 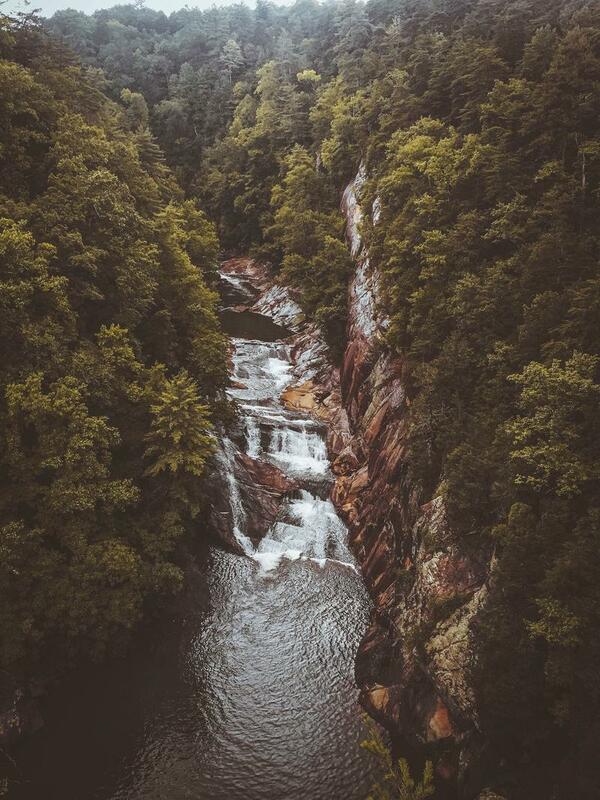 Located just a stone's throw from our luxury cabin rentals and the heart of downtown Helen, Unicoi State Park is famed for it's beautiful lake and, of course, Anna Ruby Falls. These sights are worth seeing no matter when you choose to visit the area, but they take on a whole new appearance during the fall season. One of the most popular hikes during the end of September and through October is the 2.5 mile Lake Trail. This path offers a relatively easy hike and affords magnificent views of Unicoi Lake, the mountains, and the trees. You'll notice the breathtaking reflection of the colorful leaves across the waters, and will be able to see an array of red and orange trees for miles. You may also enjoy hiking to the park from Helen and back on the Unicoi/Helen trail. And you won't want to leave the park without making the easy trek to view the double falls. From the viewing platform, you'll be able to capture some wonderful pictures of the cascades as they are framed by northern Georgia's fall foliage. Anna Ruby Falls -- These falls are a real sight to behold, and the walk to reach them is only about half a mile. Two creeks make up the falls, creating an attractive view like no other. Accessible by a half-mile trail the twin waterfalls that comprise Anna Ruby Falls are created where two creeks meet, Curtis Creek and York Creek. Curtis Creek plunges one hundred and fifty feet and York Creek drops fifty. Together they form Smith Creek which flows into Unicoi Lake. Situated in the Chattahoochee National Forest, the sixteen hundred acres around Anna Ruby Falls has been designated the Anna Ruby Falls Scenic Area, a great place to take family members or a significant other for some quality photo opportunities. Smith Lake -- This is the park's real gem. In addition to swimming and fishing, you can visit a small cove where you will find a beach house, picnic tables, and pedal boat and canoe rentals. Hiking -- Miles of short and long hiking and biking paths can be found in the park, including a seven-mile mountain bike trail. As a bonus, your experience will change with each season. Picnic Areas --Here, you will find not one, not two, but eight different picnic sites scattered around the park, from above the beach to just off the main road. Reservations can also be made in advance for small family get togethers or large parties. Camping -- In the northeastern section of the park, you will discover a number of camping opportunities. Whether you have an RV or a simple tent, there's something for everyone. Enjoy hiking, fishing, and hunting amongst the colorful leaves at Helen's own Smithgall Woods State Park. This park protects more than 6,000 acres of land surrounding Duke's creek with plenty of spots for observing nature, getting some exercise, and even picnicking along the creek. Ash Creek Trail is a great pick for viewing the fall foliage. The 1.5 mile, 1-way trail exposes hikers to a very large expanse of the Georgia woodlands, and takes visitors across the creek in which the colors are reflected. Martin's Mine Trail is also very popular, as it features a picturesque wooden bridge, and a vertical shaft that is a remnant of the gold mining era. This makes for a unique habitat for bats, and as the sun begins to go down, you can spot the critters in flight through the changing trees. Also very popular among Georgia's Forest & State Parks, Smithgall is home to a wide variety of attractions and "things to do." Trout Fishing -- Intended for pure enjoyment, visitors can partake in a "catch and release" fishing extravaganza; but don't forget your Georgia fishing license. Hiking and Bicycling -- Enjoy an amazing 23 miles of trails for hikers and bikers alike. Guided Tours -- If you really want to make the most out of your visit, a guided tour is the way to go. You'll not only see the wonderful scenery that the park has to offer, you're bound to learn something, too. Picnicking -- Grab your basket, some cold fried chicken, and your favorite potato chips, and languish in the tranquility of the gorgeous state park. The picturesque Dukes Creek which Southern Living Magazine called the holiest of holies in Georgia trout catching circles flows through the beautiful mountain retreat known as the Smithgall Woods State Park that boasts five miles of scenic trails and eighteen miles of roadways that allow visitors of cabins in GA plenty of photo opportunities among the mountain streams and wildlife. It is a site where memories can be made and is not to be missed. Want to experience autumn from on top of the world? You'll definitely want to plan a journey to the peak of Brasstown Bald - the highest point in the entire state. Even the trip to the summit is worth the effort. As you approach Brasstown Bald, you'll drive along the Richard B. Russell Scenic Highway which is lined with beautiful trees. When you reach the parking lot, you'll find picnic facilities that will allow you to take in the sights and the crisp fall air as you fuel up for a hike to the top (trams are also available for a fee). At the peak, you'll be standing half a mile above the valley's below, as a sea of red, orange, and yellow leaves spreads out to the edges of the horizon. During particularly clear autumn days, you may even be able to spot the skyline of Atlanta. With a summit of 4,784 feet Brasstown Bald is located along the upper Brasstown Creek. The area surrounding the Bald was originally inhabited by the Cherokee who called the mountain Enotah. Settlers that came to the area confused the Cherokee word "Itse'yi" which means "New Green Place" with "Untsaiyi", the word for "brass". On clear days you might be able to see the tall buildings of the Atlanta skyline and get a three hundred and sixty degree view into four different states Georgia,Tennessee,North Carolina, and South Carolina. 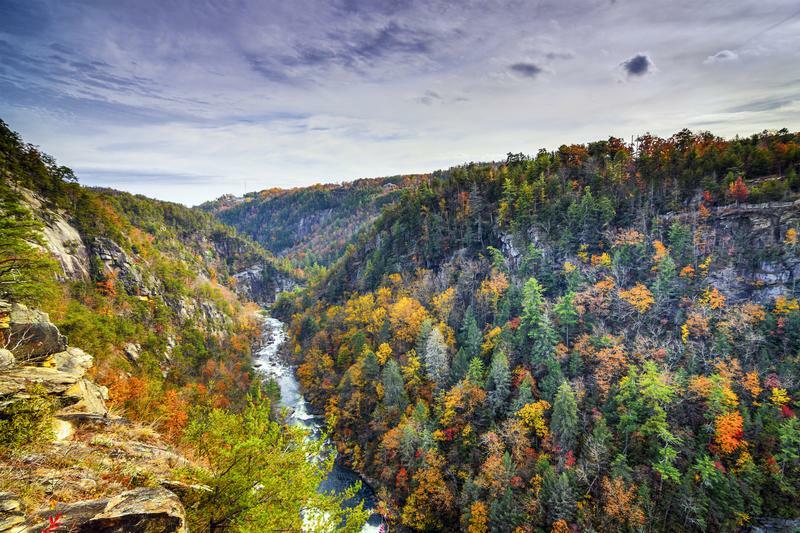 Located just 29 miles northeast of Helen, Tallulah Gorge State Park houses one of the largest and most impressive canyons in all of the southeast. The North and South Rim Trails will afford visitors some of the most incredible views of the changing leaves. Both of these trails are easy to moderate in difficulty and take hikers along the rim of the gorge with several different scenic overlooks. From here, you'll be able to observe some of the parks gorgeous waterfalls, the damn, and peaceful pools - all highlighted by the colors of autumn. Keep in mind that autumn is a peak visitor's season, so if you wish to hike at the bottom of the gorge, you'll need to arrive early as only 100 permits are distributed each day. To ensure that you are issued a permit, be sure to wear proper footwear. There comes a time in everyone's life when he or she needs to take some time off and escape the day-to-day grind. They need to get away for awhile whether it's for a personal fishing trip, a family vacation or a romantic getaway to get closer to a loved one. The spirit of adventure and romance still exists in the mountains of North Georgia, and with all the comforts of home plus a little more, North GA cabin rentals offers just what you need to create your own memorable getaway with majestic views of the Blue Ridge and Appalachian Mountain ranges. 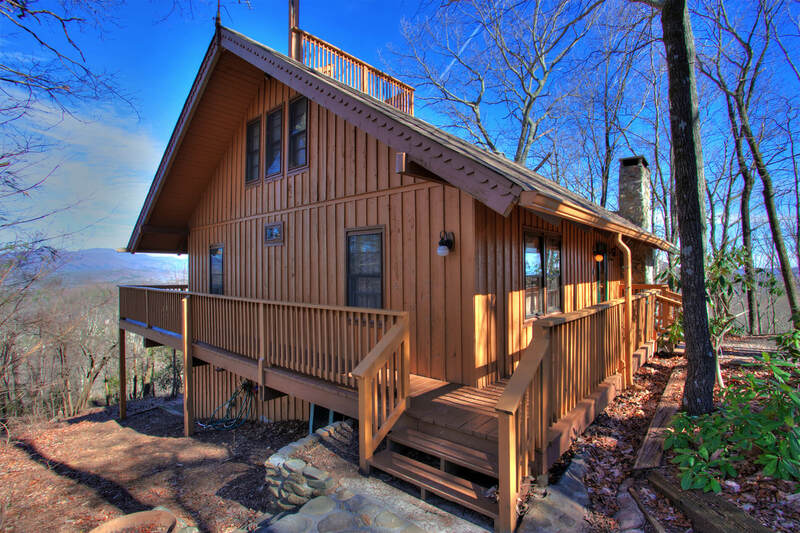 Cedar Creek Cabin Rentals has several great cabins, with terrific mountain views. Click here to see those cabins and the mountains they sit next to. North GA cabin rentals have what fishing enthusiasts are looking for. If you seek a beautiful view of the mountains and a spectacular fishing experience you can stay at Fisherman's Paradise on the Toccoa River, one of the most popular destinations for trout fishing in the state. Fishermen can cast their lines for an abundance of rainbow trout and brown trout. When not fishing or relishing the fresh mountain air, guests can spend time soaking in the hot tub on the screened porch, watch movies on the satellite TV or enjoy a game on the pool table or air-hockey table. Enjoy the abundance of wildlife as you explore the area's trails and admire the natural waterfalls. If you seek solitude and tranquility in one of the North Georgia cabins rentals, Turkey Feather can provide just that, offering a spectacular view of a green mountain valley and the distant mountains from the wrap-around porch. You can spend a romantic evening relaxing on the plush sofa by the fireplace. 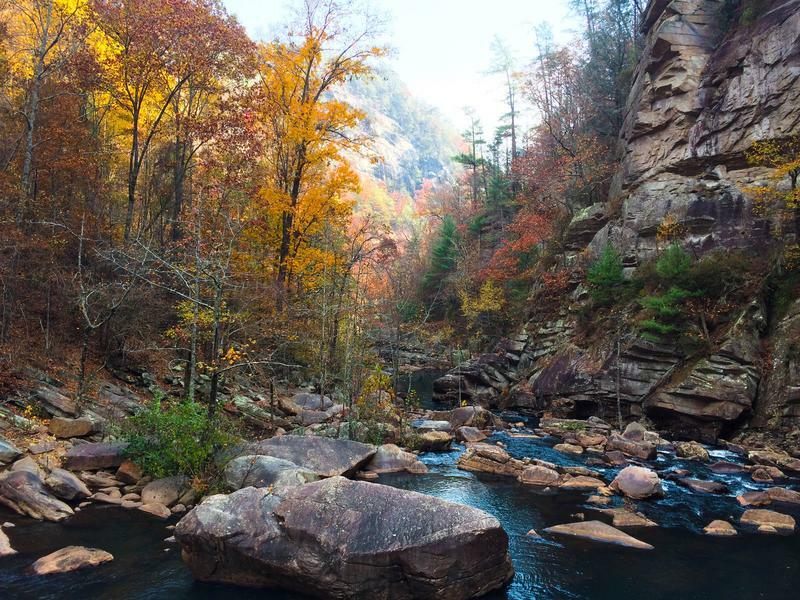 Turkey Feather is not far from the Toccoa River and provides access to some great trout fishing spots as well as white water rafting and tubing opportunities. You can also explore the surrounding hiking trails, breathing in the fresh mountain air as you fall in love with the North Georgia Mountains. Question: What does the north Georgia Mountains area have that you would love to see? Answer: Everything! The North Georgia Mountains is a region that is fairly bursting with beautiful scenery, exquisite dining experiences, a healthy, growing wildlife population and an exciting nightlife. No matter what an individual's "thing" is, they will be marvelously surprised at what is available in the North Georgia Mountains area. 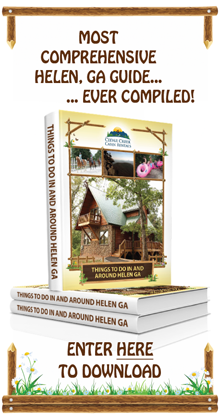 In Helen, Georgia, for example, one may rent a traditional, North Georgia mountains cabin from Cedar Creek Cabin Rentals. From there, they can fill a weekend or a week with exciting, fun or romantic activities. For the water sports lover, try the Chattahoochee water slide or plunking yourself down in a large rubber tube and floating down the historical, magnificent Chattahoochee River. Helen, GA tubing establishments offer a one hour float or a 2 1/2 hour float. The choices are anybody's, the beauty of the "Hooch" is everybody's. One doesn't even have to leave the town of Helen to have a lovely day exploring the cultural diversity of Helen. With delightful Bavarian village styled buildings, hot air balloon sightings, cobblestone streets and over 200 import and specialty shops, a vacation could easily begin and end in Helen. One would be hard pressed to find a more perfect family activity than mini golf. It is the ideal activity to satisfy all those competitive urgings between siblings and spouses. Everybody gets a chance to shine and have some great fun and laughs. In the Georgia sunshine, sipping a cool beverage and bonding with loved ones. What could be better? Spend hours or days exploring 25,000 acres of rich wildlife, picnicking, hiking, fishing and bird watching in an area dedicated to remaining primitive and pristine. Feeling lucky? Want to get really rustic and discover what old-timers used to do for a living? Try panning for gold or screening for gems, like rubies and sapphires, at the Dukes Creek Mine. The Dukes Creek Mine was the very first major discovery of gold in America! This one is a breeze to talk the kids into! Who doesn't want to be rich? They'll be eager to get their feet wet here. Finally, a way to get them to help pay for the vacation! A pure delight to visit, it is gracefully nestled in the Alpine village of Helen, not far from a North Georgia mountains cabin. This enchanting treasure features Crystal chandeliers with matching crystal wall sconces, a 22 foot cathedral ceiling, lush foliage and sweet scented magnolias, as well as other fantastic flora. A delightful place to see and spend a few hours enjoying the marriage of nature and man-made beauty. Hobnob with some very talented artists and enjoy the beauty of their works. In the midst of Helen's Alpine Village Shoppes, it's a hop, skip and a jump from a Cedar Creeks Cabin rental to the "downtown" area of this quaint Alpine village. From the whimsical to the wow, the Georgia Heritage Art Association Gallery has an amazing array of fine art pieces ranging from local Native American jewelry and pottery to captivating wall accents. OK, so at least one day should be planned specifically for the young 'uns. It doesn't get any more kid-friendly than the Goofy Rooster Corn Maze. A seasonal favorite for all ages, this attraction offers hay rides complete with a fireside smores session, a barrel train and yes, a corn field maze. Can it get any more a-maze-ing than this? Kids love it and so do parents. A really super way to spend a fall day with the family. North Georgia's newest, and dare we say funnest, attraction, ZipNTime is designed for the adventure loving souls. With all the proper safety equipment of course, visitors will strap onto a zip line and zip from hyar to thar, feeling the awesome thrill of a free-falling experience and the rush of the wind in their smiling faces, in the beautiful North Georgia mountains. Cabin guests flock to zipping venues, as it's the latest cool thing to do, and until a person experiences it, they cannot imagine the thrill of it. Guaranteed to get the kids excited and eager to zip, this crazy attraction will surpass their wildest expectations, and yours too! As is evident, while the North Georgia Mountains are certainly a place for secluded hikes, relaxing fishing and the enjoyment of nature in its finest, there is so much more. You marked your calendar and have waited all year for the chance to get away from the rush of day to day life. When you have locked up your office you head out to seek adventure in the great outdoors. Cabins in Georgia have a lot to offer to adventure seekers. Imagine, Georgia cabin rentals settled on the edge of the Chattahoochee National Forest next to the river where you can sit and watch the golden sun set behind a beautiful mountain vista. There are some great places to go for some beautiful scenery and plenty of photo opportunities to capture memories you can carry with you for years to come. Have you ever visited Helen in the fall? Where did you go to watch the leaves change colors? Share your tips and suggestions with future users in the comments section of our blog.